Who shot Argentina: The finerprints on the smoking gun read "IMF"
I keep rooting for Ted Fang’s Examiner to make it. It’s not just that I’m hot for “keeping San Francisco a two-newspaper town,” although that’s not a bad idea. It’s that I like the all-American image of a fighting small-time journalist who dared to take on the big guys. But supporting the Ex-paper these days is worse than being a Cubs fan. At least Chicago-ites have the possibility of a wild card slot to reward them for their years of patient devotion. The Examiner ain’t even trying. I know, because — with the possible exception of Florence Fang — I’m the paper’s most faithful reader. Day after day I return to it, telling myself that this time things will be different. But every time I open its meager pages, I feel like Charlie Brown trying to kick the football. Once again Lucy Fang dashes my hopes, pulling aside the connection with the world of journalism that its venerable masthead suggests. 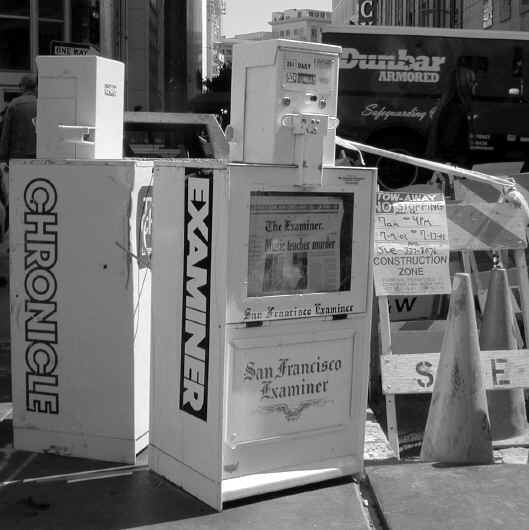 As I was reminded by the Chronicle’s website — the new Examiner has not yet managed to electronically archive its contents — the challenger fumbled its way onto the streets on November 22, 2000. Nine months later, it’s still fumbling. If it was a human baby, it would be out and yelling for its dinner by now. Maybe the gestation period for newspapers is different. Nine months. What have we got? Take last Monday’s edition. OK, it was Labor Day weekend, but that was no excuse to give the entire staff a vacation. Whoever was minding the store took us back to the good old days of last November, when stories jumped to the wrong page and typos danced merrily. What of the real-life drama that was playing out closer to home — the negotiations between BART management and two transit unions? In the bottom right-hand corner of its front page, the Examiner dutifully ran a “BART Strike Watch” box outlining the positions of each side. According to the Ex-paper’s version, when negotiations halted the evening before, BART was “offering workers a 20 percent wage increase over four years”; the unions were asking “21 percent over three years.” The Chron and the Contra Costa Times both weighed in with Bart: 18.5 percent and unions: 20 percent for the same time periods. This type of amateurish confusion may all be past history, however. Last Wednesday’s edition of the Examiner announced “big changes” in the editorial staff. In addition to editor & publisher Fang and holdover chief editor David Burgin, the paper is now being managed by a new executive editor, editorial page editor, features editor, city editor, managing editor, and assistant managing editor/group editor. That’s eight men and women. By my count, that’s about the number of active reporters the paper employs, including the three or four who cover sports. The rest of the “news” — in this instance, a broadly defined concept — comes from illustrious sources such as the Associated Press, Newsweek, and the (London) Independent. It’s a hodgepodge. Side by side on the same page, we’re likely to encounter discussions of an impending execution of foreign missionaries in Afghanistan, a bombing in a Belfast school, a description of a mammoth refugee camp in Pakistan, the search in Bulgaria for the possible site of the biblical Great Flood, and the demolition of an illegal statue of a dead cult figure in the French Alps. Fascinating stuff, every last word of it. It creates the impression of a page of giant fillers, selected for their length rather than their content. Meanwhile, real news, city news, local news, the news that draws readers to a paper — real news is sadly absent. Absent from the pages of the Examiner, not from the city it pretends to serve. A person interested in what’s happening in San Francisco need only pick up one or two neighborhood papers to discover — what you knew all along — that the place is teeming with excitement. This is news. And it’s relevant to the lives of everyone in the city, not merely to people who ride ferries or those who live in the Mission or on Potrero Hill. When Mark Simon wrote recently in the Chronicle, “I’m a fourth-generation San Franciscan, and yet it seems that the city is decreasingly important to me and to the rest of the Bay Area as a cultural, economic and social center,” it struck a sympathetic chord in many readers. Nevertheless, despite trans-bay hypesters like Simon, San Francisco is still a city to be reckoned with. But the Chronicle is too concerned with world-class matters to chronicle the day-to-day events that make it special, and the Ex-paper hasn’t a clue. As far as newspaper coverage goes, there is indeed no here here. So what’s a poor publisher like Ted Fang to do? With a limited subsidy of $66 million from Hearst, he isn’t rolling in funds to cover his new paper’s start-up costs. The money to pay dozens of reporters’ salaries isn’t pouring from the vaults. May I offer a humble suggestion? Mr. Fang, you can continue to play newspaperman, placing copies of your AP-Lite paper in perky white newsracks around the city, particularly in heavy touristed areas. 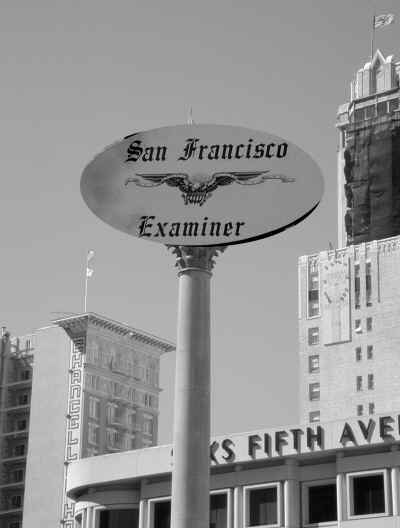 The out-of-towners will think the new Examiner is even harder hitting than the old one, and they’ll never guess that the city you’re covering isn’t the one they’re visiting. Or you can make friendly overtures to the scores of neighborhood associations dotting this city and ask to be added to their mailing list. Pay careful attention to the info they send you, because it’s your regular readers’ lifeblood. Hire a couple of hotshot rewrite people to turn this raw data into the most dazzling display of city life on the face of the planet. The Call doesn’t have $66 million — heck, it doesn’t even have $66 hundred — and that’s what it would do.